At different times, I take about 8 different anti-inflammatory supplements, including aspirin, ibuprofen, omega 3 oils, curcumin, berberine, resveratrol, ashwaghanda, and boswellia, in addition to eating foods such as ginger, rosemary, tea and several mushroom species with anti-inflammatory effects. There is good evidence for benefits from each of these individually, but I have no idea how they interact with one another. Just last week, I learned that they all act (in part) through inhibition of NF-kB. It’s certain that the separate benefits of each of these don’t just add up in combination. It could be that all of them together are no better than just one of them individually. It might even be that they interfere destructively with one another, competing for a common receptor, so that piling on more supplements is counter-productive. There is no research on interactions among longevity supplements. After a long path leading to NF-κB as their prime subject, the authors go on to test whether inhibiting NF-κB can have anti-aging effects. The first obstacle that they encounter: NF-κB has important developmental functions (in young animals) and also is essential for regulating apoptosis (in older animals as well). Mice with genes for NF-κB knocked out don’t survive gestation. So they arranged to selectively “blockade” the binding of NF-κB to DNA in old mice, in skin cells only. The result was a dramatic rejuvenation of the skin. Research with rodents and humans suggest that there are factors in the blood that keep us young and, more important, factors that make us old. Prime suspects in the latter category are the signals that dial up inflammation. It’s my hunch that the most effective anti-aging strategy over the next 10 years will be to re-adjust signal molecules in the blood, adding what we lose with age but, more important, neutralizing or inhibiting pro-aging factors. For various reasons, NF-κB is a good place to start. It is a complex of different molecules that acts as a master transcription factor. It is always resident in the periphery of the cell, waiting so that it can be activated quickly when needed. Latent, NF-κB is bound to an inhibitor molecule called IκB. When a stimulus comes along that phosphorylates the IκB, the NF-κB is freed to enter the cell nucleus and switch on a variety of different genes, which varies from one cell type to another. The best-known activity of NF-κB is in white blood cells (T and B cells) where it activates an inflammatory response involving TNFa and IL-6. Overactivity of NF-κB with age is a mediator of the systemic inflammation that contributes so much to cancer, heart disease and dementia. NF-κB itself is not circulated in the blood, but signals in the blood can cause it to be turned on. The Conboys early recognized NF-κB as one of the pathways that promote aging in parabiosis and transfusion experiments, where blood from older mice is introduced into younger mice. It is a very good bet that inhibiting NF-κB would slow inflammaging, perhaps relieving arthritic and other auto-immune symptoms immediately, while reducing long-term risk of mortality and disease. Exponential amplification is a basic principle of the body’s immune response. When the signal is received announcing an invader or an infection, there are just a few cells involved. These send signals that trigger an immune response in other cells, triggering a chain reaction. The beauty of such a system is that it ramps up quickly, and can mobilize a response throughout the body in short order. This is also the danger of the system. It requires an accurate and reliable switch to turn it off; otherwise, it can become like the Sorceror’s Apprentice, each magic broomstick producing two more to carry water until the workshop is flooded. Note: Dr. Katcher, in a note below, makes an important point about this positive feedback loop. This activates NF-κB, which blocks apoptosis that could get rid of the senescent cells. Inflammation from NF-κB turns more cells senescent, beginning the cycle over again. NF-κB is a master switch that sets in motion a chain of events that is specific to a cell type and its environment. Some auto-immune diseases (e.g., arthritis, type 1 diabetes, asthma, Crohn’s disease and irritable bowel) are associated with an excess of NF-κB [ref]. Its activation generally rises with age [in mice, in humans], but it is necessary at all ages, particularly for its contribution to the regulation of apoptosis (the selective elimination of cells that are potentially damaging). Animals lacking NF-κB are not viable; so it will probably be necessary to strongly but selectively inhibit NF-κB, beginning in middle age. Inflammatory responses are complex and focused on the immediate threat at hand. NF-κB is a master switch that sets in motion a chain of events that is specific to a cell type and its environment It’s true that without NF-κB this response doesn’t happen, but the response to NF-κB varies from cel to cell. In this sense, inhibiting NF-κB is a kind of blunt instrument. It works to damp the body’s inflammatory response globally, but even better would be if we could selectively shut off the body’s attack on itself. It’s true that NF-κB activation rises with age [in mice, in humans]. But the real problem is not too much NF-κB expression, but the fact that NF-κB becomes defocused, so that the inflammatory response is not focused on a particular threat, but generalized throughout the body [ref]. All the anti-inflammatory agents that I have been able to catalog work by one or both of these two pathways: NF-κB and COX2. By most accounts, NF-κB is upstream of COX2, but the two are interrelated. NF-κB regulates COX2, and also COX2 feeds back to regulate NF-κB. NSAID drugs (aspirin, ibuprofen, naproxen, celecoxib, etc.) target cyclooxygenase-2=COX2. Common herbal anti-inflammatories, including curcumin, resveratrol, vitamin D and omega 3 oils (the last two not exactly herbs) are active both against COX2 and NF-κB. Inhibiting COX2 is a classic strategy for combatting arthritis. The more potent COX2 inhibitors have a tendency to decrease cancer risk, while increasing cardiovascular risk. This doesn’t necessarily mean, “it’s a wash”–rather the stronger NSAID’s are right for people with some genetic risk profiles and should be avoided by others. Aspirin is the cheapest and oldest of the NSAIDs, for which there is copious data available on tens of millions of individuals. There is reasonably good evidence that aspirin leads to lower heart risk as well, probably because of anti-clotting rather than anti-inflammatory action [read more]. Daily aspirin also lowers risk of several cancers. Intermittent fasting or caloric restriction tends to prevent NFκB binding to chromosomes.. There’s also a long list of natural products that inhibit NFκB. There are a few pharmaceutical products that inhibit NFκB, though none has been developed explicitly for this purpose. These include emetine, fluorosalan, sunitinib malate, bithionol, narasin, tribromsalan, and lestaurtinib. Emetine (as the name suggests) is used to induce vomiting and also to treat amoebic diseases. It is the most potent inhibitor of NFκB among the listed drugs. Sunitinib and Lestaurtinib are cancer drugs. Bithionol is used in de-worming animals. Narasin is an uncommon antibiotic. Tribromsalan is used externally as an antiseptic. None of these is marketed to inhibit NF-κB, and none have (to my knowledge) been tested for anti-aging properties. The larger pool of prescription drugs that affect NF-κB are all steroids. For example, dexamethasoneis a glucocorticoid (steroid) drug that was one of the earliest inhibitors of NF-κB to be discovered. Many items in the list of natural products have multiple benefits. Silymarin has been reported to promote telomerase. Rosemary and cloves protect against infection. Berberine helps maintain insulin sensitivity, and was found to be as good as metformin in one test. Tea polyphenols and resveratrol have been promoted as generally anti-aging. Too much has already been written about curcumin. New to me in this list is celastrol, an ingredient in thunder god vine (Tripterygium wilfordii). This is a Chinese herb (leigong teng = 雷公藤), that has been prescribed for centuries in formulas to relieve arthritis, along with lupus, MS and other autoimmune disorders. It is reported to be a powerful appetite suppressant and weight loss aid. The trouble is that it is toxic, and the thunder god root must be prepared carefully in order to exclude triptolide, which is yet more toxic. Experienced practitioners of traditional Chinese medicine know how to mix with other herbs and control dosage to minimize side-effects. In the absence of this kind of expertise, I can only counsel experimenting gingerly with tiny quantities of thunder god vine in order to guage your personal response. It would be interesting (from a theoretical and a practical vantage) to know what is the maximum benefit available from manipulating the inflammatory pathway. Inflammaging is linked to all the diseases of old age. Suppose we dialed the systemic inflammation in a 80-year old back to where it was when he was 20, but we made no other change in the body. What would be the effect on mortality and morbidity? On vitality, resistance to infection, and stamina? In other words, how much of the aging process is directly attributable to inflammation? We might try to get a handle on this question via an epidemiological calculation: What is the correlation between inflammation and all-cause mortality? If we extrapolate back to the inflammation level of a 20-year-old, how far does that go toward restoring the mortality rates of a 20-year-old? We might think to look at genetically modified mice without NF-κB; however, they die in utero. (There are no pure aging genes; aging is caused by re-balancing hormones and proteins, all of which have life-supporting as well as life-denying functions.) There is a genetic variant of NF-κB that tends to be more common in centennarians than the rest of us [ref]. How much does inflammation rise with age? 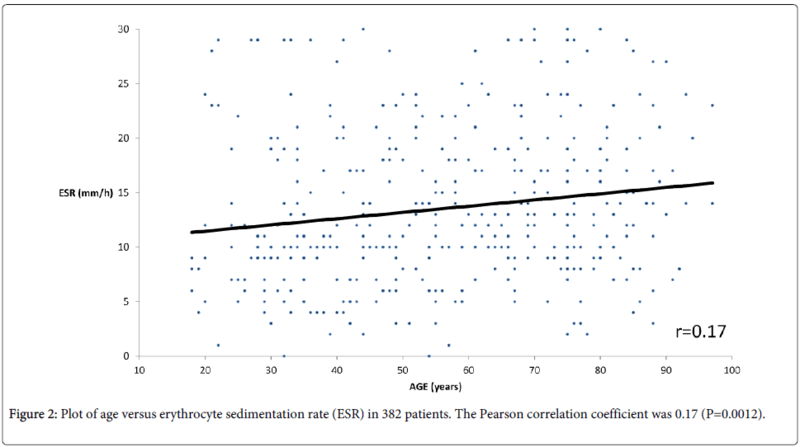 120 years old, the ESR test is still the most basic (and cheapest) measure of systemic inflammation. The quantity measured is the number of red blood cells that clump together and fall out of solution in one hour. Inflammation makes red blood cells sticky, and I’ve seen two explanations for the reason. One is that fibrinogen, the clotting protein, rises with inflammation; the other is that the negative charge (zeta potential) naturally associated with oxygen-carrying red blood cells decreases with inflammation, so there is less mutual electrostatic repulsion. The increase in blood’s tendency to clot that is associated with inflammation is part of the reason that inflammation is a risk for heart attacks and stroke. C-Reactive Protein is a protein created in the liver as part of the response to inflammation. It is easily measured with an antibody, so it has become the second most common blood test for inflammation. A Glasgow study of 160,000 patients found strong correlation between CRP and near term mortality (within a year, HR=20) but not much for longer term. This is not what I was expecting. In 26,000 patients, inflammatory markers were associated with a 1.5-fold increase in all-cause mortality (ACM) over 8 years. 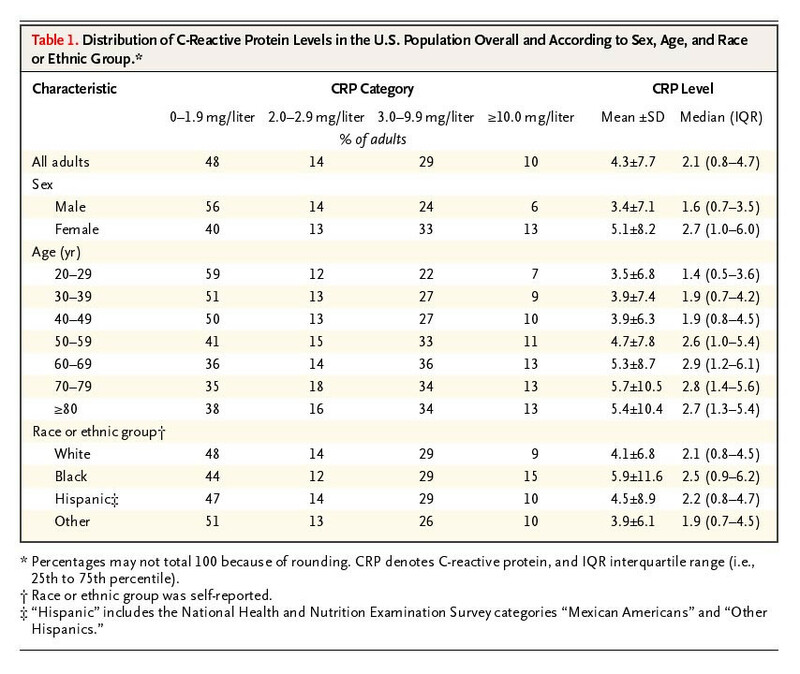 A Norwegian study of 7,000 men and women found that high levels of CRP raised ACM only by a factor 1.25 (equivalent to just 2 years of aging). For comparison, the ACM risk for an 80-year-old male is 60 times higher than a 20-year-old male. The corresponding number for females is nearly 120. The implication is that either inflammation is a minor (though significant) cause of mortality, or else the markers that we have for inflammation (including ESR, CRP and leucocytes) are not capturing the rise in systemic inflammation. In the Prelude above, we found evidence that NF-κB is a master regulator that turns on a suite of genes that “enforces aging”. But in the section, How important is inflammation?, we found evidence that, while inflammation certainly increases with age, the increase is not large compared to the scatter among individuals. Centennarians commonly have high levels of inflammation, along with robust health. Large increases in inflammation are common just in the last year of life, but they are not well correlated with the gradual increase in mortality with age. The combination of these two findings suggests that NF-κB has other powerful roles in promoting senescence, in addition to its well-known role as effector of inflammation. Maybe it is a master regulator of development and aging, akin to mTOR and FOXO. It is a hypothesis worth testing that carefully tailored inhibition of NF-κB is a life extension strategy, so long as we can preserve apoptosis at an appropriate level. Great article, Josh. Pretorius and Kell wrote about the ESR and how it’s related to hypercoagulation and inflammation. They implicate both iron and lipopolysaccharides from translocated bacteria, or even subclinical infection. Very small amounts of LPS can induce hypercoagulation. LPS could be an important source of inflammation in aging, and that entails a loss of gut integrity (barrier function). so Im not sure now which, if any, of my supplements to discontinue. I take Omega 3, glucosamine and resveratrol daily also a combination capsule that contains ashwaganda and rhodiola. I avoid sugar, wheat, corn and soy and I don’t seem to have any real arthritic problems. I’m 68 so… I dont take daily aspirin but it sounds like maybe thats a good thing? like I shouldnt do both supplements and aspirin? This last finding is most significant, since the inverse differential pattern – a decrease in global H3 acetylation with an concurrant increase at proinflammatory loci – is one of the epigenetic hallmarks of aging. Thanks for these references – this is good to know, and hadn’t crossed my radar. Does anyone know what is happening with anatabine citrate that was the component in Anatabloc? It supposedly worked through this NF pathway..The FDA took it off as a supplement due to labeling (and a Republican governor imho), and Rock Creek Pharmaceutical went bankrupt. Meanwhile, this supplement “cured” fairly severe hand arthritis for me as well as a knee and ankle. None of the others have done as effectively, (tried almost all in this article). Would like to see some company buy the patent if need be and roll it back out as a supplement. Nice article Josh, yes it seem that NF-kB is responsible for the phenomenon of cellular senescence and in that regard is responsible for the diseases of aging (as senescent cells are a major contributor to aging by releasing many factors that promote inflammation and promote cellular senescence. One NF-kB binds to its various sites on DNA, one of the first things it does is prevent apoptosis – so that the cell is now producing all manner of deleterious substances and can’t kill itself. I believe this phenomenon is seen in lower animals, even those like C. elegans, without an immune system worth talking about (sure there are some antibacterial peptides and a dual action oxidase that produces H2O2 to fight bacteria – which are its food) show a similar phenomenon in their increasing production of H2O2 with age. Now of course the question, which I think it not perhaps hard to answer is why NF-kB becomes more ‘sticky’ with age? There is some evidence that a non canonical Nf-kB pathway is linked to EZH2 overexpression. EZH2 is the catalitic subunit of PRC2. PRC2 binding sites are the ones affected by hypermethylation in the epigenetic clock. Thank you Josh for great information ( as always). I want to ask your opinion on the views of Dr.John Sanford, Cornell University geneticist. In his book Genetic Entropy he describes how our human genome is deteriorating due to the accumulation of mutations. In fact mutations are accumulating in all the higher animals. If I understand it correctly, the mutations occur due to breakdown in chemical process because of physical damage, nutritional deficiencies,external energy (radiation), etc. Are these mutations the major obstacle to our longevity ? Do you mean accumulation of somatic mutations during an individual lifetime, or accumulation of mutations in the germline over thousands of years? Despite Yale Univ lab finding Nlrp3 associated only with damage causing functions – besides triggering inflammation It lowers bone density, reduces cognitive function, and creates insulin-resistance – no ambiguity about providing any benefitial functions so far and increases with age – I am personally against interventions that involve inhibition. Our biochemistry is so complex – we may end up trading away unknown benefitial functions. Upregulating or activating agents that protect against paradoxical inflammation but which diminish with age may be a more safer approach. For example lamin-b. It represses expression of genes associated with inflammation unless there is an injury or infection. For some unknown reason this check diminishes causing immunosenescence and inflammation. While I was fascinated by this discussion on delaying aging, I was also stunned that it never mentioned anatabine which has much science to support it. In a full page ad in the June 2016 issue of Biopharma Dealmakers where Rock Creek Pharmaceutical made a last ditch effort to find a funding partner for a Phase 2 Study in psoriasis. Dr. Michael Mullan, then CEO of Rock Creek explained, in detail, how anatabine’s MOA “triggers downstream inhibition of two signalling pathways that are central to the inflammatory response: the janus kinase(JAK) -signal transducerand activator of transcription 3 STAT3) pathway, and the glycogen synthase kinase 3B (GSK3B)-inhibitor of nuclear factor-kB kinase(IKK) -nuclear factor-kB(NF-kB)axis. Inhibition of these two pathways prevents activation of the transcriptional regulators STAT3 and NF-kB, respectively, which results in suppression of cytokine release triggered by inflammatory stimuli”. He went on to say, “Much of the scientific excitement about this drug derives from the potentially far-reaching clinical relevance of its mechanism of action, implicated as it is in a wide range of inflammatory and immunological conditions”. Ronald, this can be the cause, supplanting “…Anatabine’s main mechanism works by inhibiting the signal transducer and activator of transcription 3 protein (STAT3), which inhibits a protein responsible for DNA transcription, called nuclear factor kappa-light-chain-enhancer of activated B cells (nF-kB). Both Boswellia serrata and Feverfew have a similar mechanism. Due to limitation of anatabine supplements on the market, it is not a practical anti-inflammatory supplement.” https://examine.com/supplements/anatabine/. And of course Belmonte agrees that the aging program is implemented through epigenetic changes, having demonstrated that systemically rewinding back epigenetic clocks by Yamanaka factors can prolong lifespan by 33-50% in LAKI mice. Yuri blasco also shows the Salk technique also resets telomeres in her latest paper too. Two hallmarks of aging for the price of one. can you share the link, pretty please? Have you checked the anti-inflammatory action of Statins? My understanding is that silymarin from milk thistle reduces degradation of IkB in proteosomes, thus limiting free NFkB in the cytoplasm. I’ve never posted a reply before, so let me just say thanks for all your work on aging and anti-aging strategies, and for sharing all your knowledge in your book, blog and website! However, my sense is that, whenever a human function or capacity has its basis in a small anatomical region (or, similarly, has its basis in a single gene), we should expect that at least a few humans will experience complete dysfunction in that region (or, again similarly, that gene), so that we should expect that at least a few humans will entirely lack that function or capacity (at least so long as a human can stay alive entirely lacking that function or capacity). But, to my knowledge, there is no evidence of a single human being who does not age. Is this evidence against your favorite hypothesis, and if you don’t think so, are you willing to explain why? Thanks for the reply and for the link (that’s an amazing story). Yeah, after I posted my comment, I realized that, if the brain region in question is the basis of an additional function/capacity, and if a human can’t stay alive entirely lacking that function/capacity, then that would explain the complete absence of human beings who do not age were your hypothesis true. It seems plausible that development might be such an additional function/capacity. That, together with the existence of people who largely fail to undergo development (your link), alleviates my concern to some degree. But I worry that, on your expanded hypothesis (namely, that there is a single brain region at the basis of both development and aging), we should still expect to encounter a few people who have completed development normally but who don’t age, since we should expect that at least a few people will experience, after having completed development, complete-dysfunction-inducing trauma to the brain region in question (bonk on the head, tumor, etc.). Thoughts? Maybe the brain region in question is the basis of an additional, essential-to-life function/capacity other than development, it’s just that current knowledge is silent on what that might be? Trillions of replications over milliions of years and not a single species has a mutation in the regulation of aging. It makes it very tempting to believe that this is governed by entropy – unbreakable law of physics rather than a set of instructions. Had it not been for reversal to embryonic state seen in turiptosis or some studies it would be irrefutable. One of the major unsolved mysteries. But even if we are not programmed to age – even if evolution were somehow incapable of producing a human being that fully maintains itself and thus can live beyond, say, 150 – I don’t think the explanation would have anything to do with entropy, i.e., the second law of thermodynamics. One way to see this is that, if the second law precluded full bodily maintenance, then it would also preclude building such bodies in the first place. I see that this is from 2008 and I don’t understand why it should not be regarded as a milestone finding. I though that the question was still open as to whether the body would ever be able to repair the damage in aged tissue – whether or not the damage arose from wear-and-tear or programming. I know that Josh believes it can. Aubrey DeGrey doesn’t and he says we will need senolytics and agents to break ‘glycospane cross-links’. This seems to answer that question in the affirmative. What am I missing? In the body of the study, two images appear that show both NAD+ NMN important and are worth a look. The story is about how NMN is a precursor or booster of NAD+. No mention of NF-kB.